Site: Full sun and good drainage are important for flavor and good growth. It is well suited to the rock garden or the front of a border. In England, it is grown between paving stones so that when it is trodden on, its highly aromatic scent is intensified. Growing: Thymes are very large family of plants which have been employed in the preparation of Greek and Mediterranean cuisine for centuries. 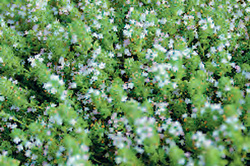 French Thyme, English Thyme, Caraway Thyme, German Thyme, and Lemon Thyme are a few of the most common varieties. The pungency depends on the variety chosen. 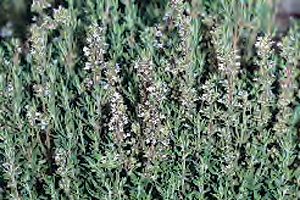 Common thyme is the strongest, lemon thyme is less pungent with a citrus flavor which makes it an excellent ingredient for custards and caraway thyme has a unique pine - caraway aroma. Some creep along the ground and others grow in a 1 1/2 foot clump. Harvesting: Leaves can be picked at any time of the year but they are best while the plant is in bloom. 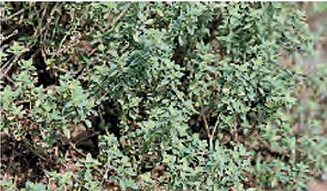 Thyme can be dried and it can be frozen also. Culinary Uses: This herb is the traditionally paired with parsley for poultry stuffing. Chop the leaves very fine to extract the flavor for garlic and tomato dishes, stuffing and marinades. Whole stems can be added to soups and broth but remove them after cooking. 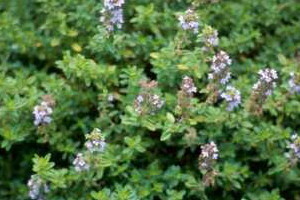 Thyme also adds a great flavor to vinegar and suits food cooked slowing in wine, especially poultry, shellfish and game. Whole stems can be rubbed onto meat before roasting. It can also be added to fruit salads, hot vegetables and jams. Use sparingly depending on the variety that you grow.